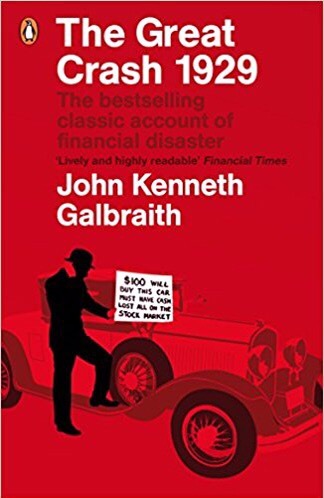 John Kenneth Galbraith, the legendary economist and public servant, wrote this book in the midst of difficulties he was having in completing another, The Affluent Society. The result is generally regarded as the definitive work on the Crash. But in spite of the seriousness of the subject Galbraith writes with a lightness and humour that leavens the complexity, and which pokes fun at the folly of human beings. Because what Galbraith depicts is a sort of collective madness that gripped a nation, or more specifically the wealthy of the nation: it was only really they who had the cash to speculate. The rising market of the 1920s convinced many that they could become rich without much effort. It was this delusion combined with extraordinary social inequality, other structural defects in the economy, and inadequate mechanisms and political will to regulate the craziness that led to a Crash of enormous proportions, which acted as a prelude to the Depression and the devastation of millions of lives across the globe. Galbraith notes that, “I have never adhered to the view that Wall Street is uniquely evil, just as I have never found it possible to accept with complete confidence the alternative view… that it is uniquely wise.” But, as John Lanchester demonstrates in his book,”How to speak money”, the opacity of financial and economic language makes these sectors relatively immune from the sort of democratic scrutiny that other critical sectors, such as defence or the public services, are routinely subject. In such circumstances those who have mastered the language can appear sagacious to the uninitiated. Galbraith describes in colourful terms just how dangerous this is and the risks that pertain when this happens. As the 2008 crash showed the economy has not yet been inoculated to human deceit and folly, and citizens must remain vigilant lest some future charlatans seek to sell financial snake oil to the rest of us. This entry was posted in Book Review, Finance by aidanjmcquade. Bookmark the permalink.